Texas goose hunting offers a wide variety of hunting opportunities including decoy hunting fields to hunting on lakes and waterways. Since falls in Texas are still very warm and typically quiet dry, hunting is generally very comfortable without the high rainfall and snow that is common in more northerly hunting locations. Texas goose hunting is best under conditions that are a bit cloudy, overcast or even slightly misty rainfall, as this provides some additional protection and cover for hunters. Texas goose hunting opportunities include Canada geese, Specklebellies and Snow geese. Lodges and guided hunts are very popular, with early morning hunts the most common. Most guided hunts will start with placing decoys, setting up blinds and getting situated in the fields or beside the waterways just before sun rise, usually between four and five in the morning. The hunt will then continue until close to noon, or whenever legal limits are reached. Most guides and hunting lodges specializing in Texas goose hunting packages don’t hunt in the afternoons to allow the geese to feed and settle back into their natural patterns. One of the advantages of goose hunting is the availability of crops surrounding waterways that makes for an ideal combination. The peanut crops, dedicated hunting lands and leases and day leases that are available through a guide allow hunters literally unlimited access to hundreds of acres of prime Texas goose hunting land. 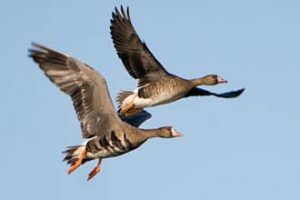 Most of the guided Texas goose hunting packages offer day hunts that include pre-scouted hunting spots, blinds and spreads, access to the location via vehicle or ATV, advice on hunting methods, professional guides for setting decoys, calling and tagging and processing of the geese once they are shot. In many packages there are multiple day hunts offered, typically from 3 to 5 days. With additional days there is a much greater chance of bagging your limit of geese as well as an opportunity to learn more about both the habits of the geese as well as Texas goose hunting. For Texas goose hunting in fields, most guides will also provide the white overcoats and suits used for Snow geese, plus they also supply the decoys, calls and other equipment. Hunters will need to have a valid hunting license, their own shotgun, and appropriate and legal ammunition for hunting geese. Most lodges and guides offer additional ammunition for sale at the hunt should a hunter need different or additional supplies. Guided parties are usually four or more hunters, but there are also guides that offer private services and work exclusively with small groups of hunters, especially in day hunts. Texas goose hunting guides are often booked up to one season in advance, so be sure to book early if you have a particular guide or location in mind to hunt. Many guides have mostly repeat hunters, so the earlier that you are able to book the more likely you are to be able to find the guide and the location you are looking for.